Music Inspired by Alchemy is the third in what appears to be an occasional series of albums released by the members of the Polish prog outfit Annalist, but not, apparently, under that name. In the liner notes they call themselves “Inspire”. To be precise the first album, Music Inspired by Tarot (1998) involved only Artur Szolc; the second, Music Inspired by the Zodiac (2001) involved all of the guys. Certain listeners will be familiar with Robert Szrednicki in his role as producer of Riverside and Lunatic Soul. At any rate, Annalist and Inspire have the same lineup. …Alchemy is an album of short, largely instrumental prog/ambient pieces, full of atmosphere and melody, with rich arrangements of synths, strings, guitars and percussion. Plenty of guests contribute everything from vocals to strings and horns; it is clearly related musically to the other two Inspired by… albums, but with more mature production values. Most of the track titles take the names of various historical (and perhaps not-so-historical) alchemists and occultists. However (yeah you saw this coming, didn’t you? )…while it makes for pleasant listening, there is very little that is especially gripping about this album. The standout tracks are clustered near the beginning: “Alexandria” is a powerful opener with sweeping synths and orchestration, and a vaguely eastern rhythm and flavor, and the next two tracks manage to maintain the interest by being different enough but also very atmospheric. Of course, one must give special mention to the three tracks on which Mariusz Duda provides vocals (not words, mind you): “Transmutation I”, “Faustus”, and “John Dee”. His voice is a thing of such extraordinary beauty and emotion that it really can elevate even the most conventional piece above the ordinary. Overall though, the album does not live up to the promise of these songs. The tracks range from experimental ambient to almost conventionally poppy — and almost all of them are simply way too short. 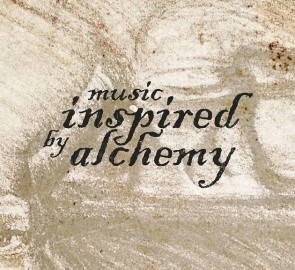 That is the major problem with Inspired by Alchemy – instead of a sweep of emotion carrying the listener along through track after track, it comes across as more a compilation of movie or game soundtrack snippets than anything else (in fact, “Hermes Trismegistos” sounds like an outtake from the soundtrack of the movie Serenity). The pieces are barely long enough for the ideas to really develop: as soon as something begins to sound interesting, it ends – only reinforced by the fact that “Edward Kelley”, one of the few long-ish tracks on the album, manages to sound like a full-fledged song. This would make for good background music, but even then it doesn’t work completely: there are very nice moments, and ones bound to grab attention for a brief time, but overall it is just too disjointed-sounding—its brevity works against it. Given that this is the third effort in this series, it is strange that it strikes one almost as a freshman effort with the kinks still to be worked out. However, it has also been more than a decade since Music Inspired by the Zodiac so maybe it’s like starting over, I don’t know.